Snowbasin resort in the Ogden Wasatch Mountains is a basin dominated by a north-south running ridge line with five peaks across the ridge. The dominant weather pattern is from the northwest through southwest. Every once in a while we will see swirling weather from the south or east, but rarely. Any time that weather comes from anywhere other then straight south or north, which even more rarely happens, the clouds will get hung up on the Snowbasin ridge line and linger. They must linger long enough to empty out their precipitative mass to then move on. On this particular day the Ogden winds were blowing from the east to the west stacking big thick clouds up against Mt. Ogden and the Snowbasin ridge line. 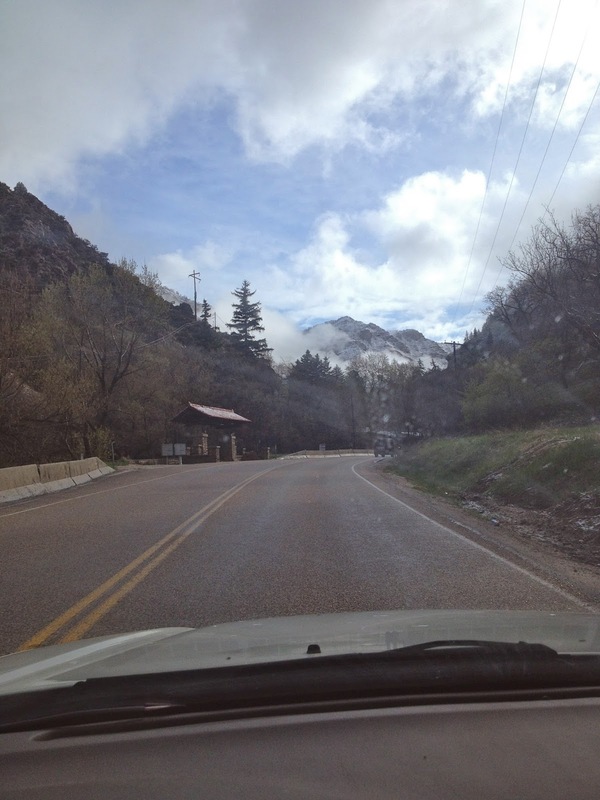 This has come to be called the infamous, "Death Cloud" of Snowbasin. It is a phenomenon we know all too well, but still it has a way of messing with my head when I am in it. The other day was no exception. Well, actually it was an exceptional day, because I allowed the Death Cloud to get in my head more then I typically do. I suspect my particular schedule that day was playing into my mental state, but typically I can play the game much cooler then I did. ^The forecast alone told me all I needed to know that the Death Cloud was going to be a factor to contend with. 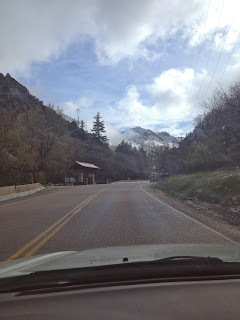 Driving up Ogden Canyon to Snowbasin I had devised a tentative plan to scout out. Snowbasin was closing down incrementally, and at the time the Strawberry gondola was closed for the season. 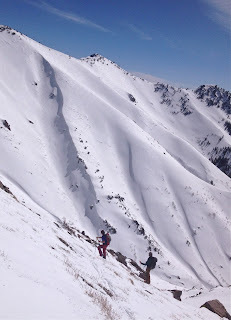 This limits access to all of the upper elevation bowls along the Snowbasin ridge line. However, for someone like me who would typically rather tour anyways this is one of my favorite times of year. I can tour to ski lines that are typically getting mauled by the masses when they have the easy access from Strawberry gondola. When it is closed though the patrol turns the area back into its natural backcountry state leaving the bombs in their packs to concentrate on tearing down the ski resort. ^Spring time with green grass and a skiff of snow. This storm pattern we just received also has a handy nickname that we call the 4/20's. It never fails that we get a wet heavy storm right around the April 20th time frame. Usually the storm set is preceded by enough warm weather that most folks forget that skiing is a thing and hang up their ski gear for bikes and flip flops. However, my buddies and I anxiously await the arrival of the 4/20's. The storm set was moving out on this particular day, which usually results in a day or two of Death Cloud status as the storm slowly works its way over the ridge. Driving up in the picture above you can see how the visibility is fantastic where I am at about 5,000 vertical feet above sea level in my Subaru with green grass brightly poking through the skiff of snow. The storm set was mostly rain at 5,000 feet. ^At 9,000 vertical feet above sea level it was a whole different story though. As I put on skins and layered down for the ascent into the white abyss I took my time because my touring partner, Ben Geiger, was coming up behind me by about twenty minutes. As I mentioned earlier, I had devised a plan on my drive up. Knowing that the Death Cloud was going to be an issue to contend with most of the day, but it was forecasted to be on a clearing trend throughout the day as well. I had a plan to skin a sub-ridge we call the North Shoulder to access the ridge. This would then leave me the options of skiing the trees of the North Shoulder while the Death Cloud was in, but also close access to Middle Bowl Cirque and Needles Peak if the sun were to break out to allow me to ski bigger high alpine style lines. 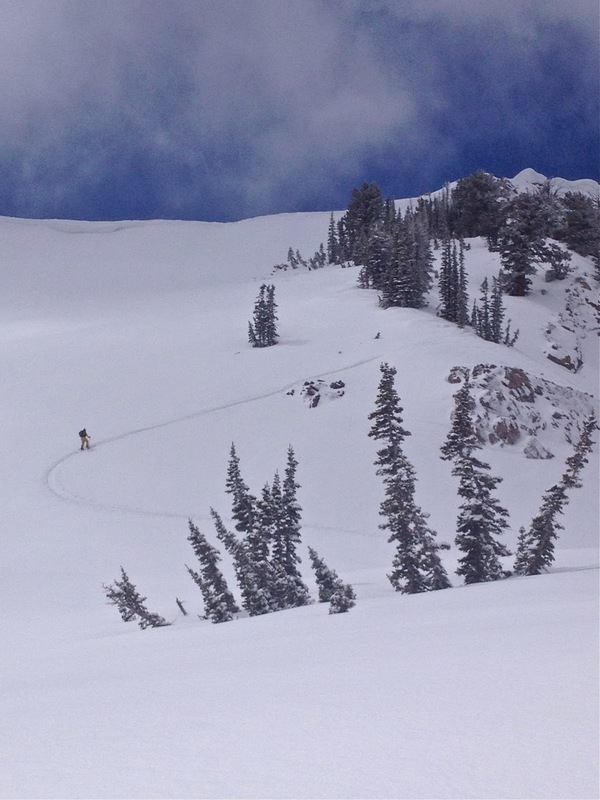 The lines are all on the shorter end of the spectrum as well, which lent itself to relatively less exposure to larger avalanche terrain. The heavy snow on a harder surface, and some decent winds, is a recipe for taking it a bit easy and limiting the avalanche exposure to a certain degree. ^Ben arrived and brought with him his usual enthusiasm. He wanted to ascend further up to Needles Peak to go for the gamble with the clouds. The weather was looking like it was going to clear so I scrapped my North Shoulder plans and we went for it. ^On the ascent to Needles Peak the clouds were looking like they were going to clear. My stoke was high and the anticipation was building. However, as soon as we neared the peak the Death Cloud moved back in and shut us down for a good 45 minutes. This is when I let the psychology of the death cloud get to me. I was antsy. I veered from my plan and was now paying for it with time. As I also mentioned earlier I had a time constraint that day to get home to take over watching over my young son Amos. Couple that with the prospect of traveling back to Wisconsin the following week meant it was going to be my only day to make some turns for the next week and a half. Usually I embrace the Death Cloud waiting it out like Ben and I were trying to, but for some reason I could not hold back my frustration with the clouds. In the time it took to get up there and wait it out I could have made three laps in the trees on the North Shoulder, which was my original plan. I was going to just keep skiing trees until the sun really broke out in full force beyond just some "sucker holes" of short-lived blue sky. Eventually, I had enough, threw my hands up, and descended off the peak back down to the North Shoulder just to start some skiing. Of course, my lack of patience was punished by an adequate clearing literally five minutes after I freaked out and called us off the peak. Ben thought it was hilarious. For some reason, I could not get to humor that day about it. It kind of bothered me that I was so irritated by it too, which only made me more irritated with myself. Ben and I were back around on the skin track I had set in no time, and Ben says to me, "I think it is clearing so I wanna head back up and try again, but I definitely don't want to drag you up with me if you aren't feeling it." I wasn't, but I went anyway. My buddy wanted it so I had to take his back. Ben is more then capable of operating solo up there, but I went anyway. Back on top of Needles Peak again, and the Death Cloud was messing with us once again. I was not handling it well again either. Then, there was enough of a break in the clouds, and a break in my psyche, that I decided I was going to get in there. Ben had eyes on me as I went in for the first of two ski cuts I wanted to make to test the slope. On my first ski cut a pocket of snow popped out and a small avalanche ran the distance of the line. I looked back at Ben who is always the mystic type, and we both realized that maybe the Death Cloud was actually trying to tell us something. I made one more cut to verify our results and sure enough another small pocket popped and ran the length again. We quickly backed off Needles Peak and opted for lower angled slopes on a different aspect. As we did, the sun broke out for us to light up our ski descent for just a moment. We seized the opening and scored some beautiful lines. Ben blew out an edge on his ski when we were operating on the ridge, which took him out for the rest of the day on those skis. I said good-bye to my buddy, curled back around, and started skinning again for another lap. 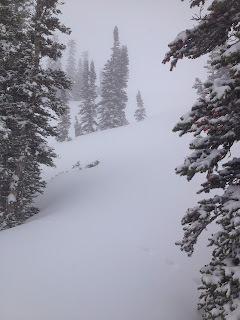 I went back to my original plan and ended up making two more laps in the cloudy trees on the North Shoulder as the Death Cloud moved right back in again quickly. This time I worked the plan, and decided that if the sun broke out for me again by chance when I approached the ridge then I would take a run at the Middle Bowl Cirque lines. If not, then no big deal, I would just keep skiing powder in the trees. I was running short on time while ascending in the cloud on my last lap of the day and resigned myself to another tree run. However, just as I got to the ridge the sun broke. Without knowing how long the break would last I was peeling skins and packing up with more haste then I have had on skis in a very long time. In a huge hurry I traversed quickly across the ridge to gain a line right in the middle of the Cirque. I was perched on top of the line and the clouds were threatening to ruin my hasty moves to get there. Two quick breaths and I quickly shoved in to the line. ^Yes!! The sun had finally broke well for me, and I nailed a beautiful line in the Cirque! I was so pumped at the finish. I quickly turned to snap this picture to commemorate the victory for this website, and not a moment too soon. While I skied the line I had heard someone hooting and hollering at me in celebration. ^I looked towards the noise when I got down to notice a dude skinning up the up-track I had set. He was fist pumping and hooting at me. He was all stoked up at the sight of my descent. I gave him a big wave. He hollered his approval again and turned back to head upward to get some of his own lines. I just smiled and turned to head home. ^Driving home and I was totally in my own head thinking about just what the hell happened to my typical cool as a cucumber nature up in the mountains. I almost never get fired up like that. To a point I try not to get that emotional up there. I could tell that Ben was surprised at my attitude as well. It kind of bothered me too. I should never allow myself to get like that in avalanche terrain. I need to keep a cool head. I know that. I am almost embarrassed by it now as I write this. However, I wear my emotions on my sleeve, always have, but in the mountains I have always been a cool and calm operator. I am still not exactly sure what happened, but I can do better. I will do better. That is for certain. I live and learn in these mountains. The only reassurance I can take from the day was that I recognized my bad attitude, made the adjustment, and ended up being rewarded once again by the Death Cloud with a really beautiful line to end the day. I like to say that "life also happens on skis" and I guess that also means that my life happens on skis… good, bad, emotional, and irrational sometimes. As I came to peace with my day while driving home in blue skies I felt much better having taken the time to relax and remember that the Death Cloud is what it is. My psychology within the clouds is completely up to me, and I must be calm, patient, and mindful in these mountains… in this life.